K & G Tool has the unique ability to help you save both. NOW OFFERING EDM MACHINING SERVICES! Mitsubishi FA-20: 5-axis Wire EDM Machine 19.69 x 13.77 x 11.85 inch X, Y, Z machining range. Automatic wire threader, submerged arc, and anti-electrolysis power supply. 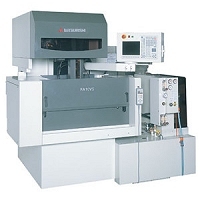 Mitsubishi FA-10: 5-axis Wire EDM Machine 13.77 x 9.8 x 8.66 inch X, Y, Z machining range. Automatic wire threader, submerged arc, and anti-electrolysis power supply. These are brand-new state-of-the-art machines. Since 1973, K & G has become known for full-service turnkey machine.&bnsp; In addition we offer design and build. We specialize in CNC turning and machine center. Of course, at K & G you can count on complete service and support after the sale. By interconnecting all of these services, we make it easier and more convenient for you to effectively plan for your future. K & G Tool provides a full-service solution to your manufacturing needs. Combining flexible manufacturing capabilities with engineering and design expertise, K & G Tool is uniquely qualified to provide innovative equipment and systems for a variety of manufacturing industries. K & G Tool strives to give our customers the highest quality in both product and service. We pride ourselves in the personalized care that we give each and every customer. K & G Tool's modern facility enables us to expediently meet the increasingly sophisticated demands of our continually growing customer base. If you have any questions regarding our services and/or capabilities, please don't hesitate to contact us.